I'm back again for my second DT card of the day, this time it's for Papertake Weekly. This week we are very kindly sponsored by the Ribbon Girl and in order to be in with a chance of winning we would like to see stitching, real or faux on your projects. Once again I have used the freebie digi from Saturated Canary called Boobie Love but this time I have coloured her with black skin. This was a first for me and was a nice change. I think I will try a few different skin colours over the coming weeks/months. Here's my card and I've used a combination of a sewing machine stitch and faux stitching. 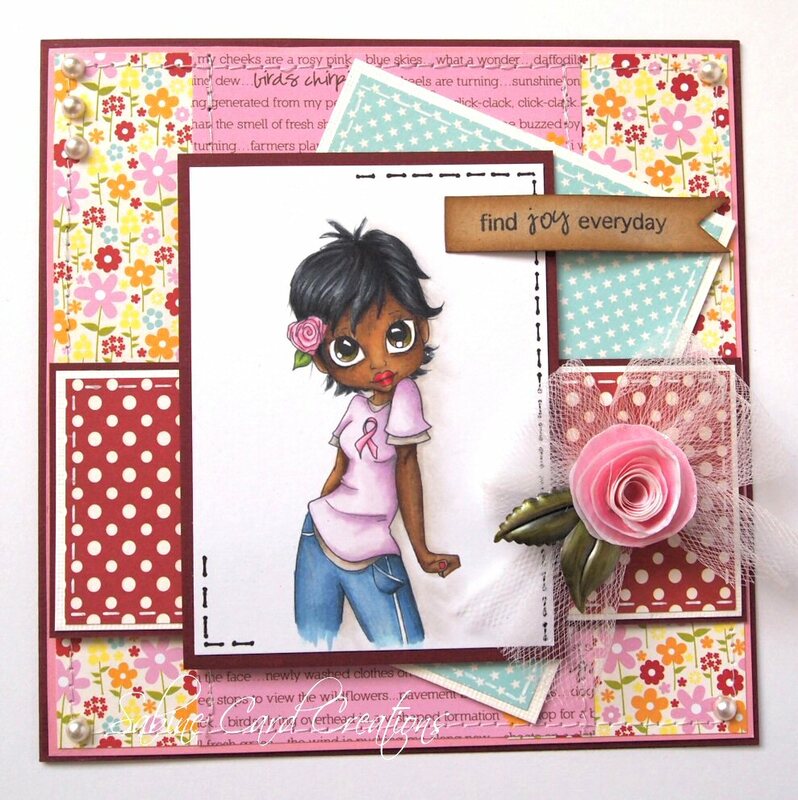 I've used Jillibean Soup Blossom pad, pink paper, cream and cranberry card. As mentioned above, the image is from Saturated Canary and has been coloured with Copics. I have also made my first paper rose with vellum. I seem to have a lot of vellum but it's something that I never use on a card. When I saw the technique shown on Create and Craft by a very talented lady who's name escapes me, I just had to try it. To make this I started with a circle of white vellum and to it I added a swirl of RV34 to give the flower a two tone effect, before cutting into a spiral shape. It's nowhere near as good as the examples I see out in blogland so me thinks a lot more practise is needed, but this one has just passed my scrutinising to make it onto the card! Be sure to check out my fellow DT buddies for lots more inspiration. At the weekend I visited the Alexandra Palace craft show and boy did I spend a lot! If I hadn't run out of time I think I could have kept spending. Obviously there were the estentials that always seem to run out at the same time so after purchasing that I then added to my bag with a few LOTV stamps, paper from Craftwork Cards, Nellie Snellen stamps, loads of sentiment stamps and other bits and bobs. Oh well, it will get used at some point. Everybody Art Challenge today are new. The first being a cute image from Nellie Snellen and second, one of sentiments I purchased from Little Claire Designs. I think the Cowboy is such a cutie, I couldn't resist him. The papers are from the Complete Boy stack from My Minds Eye and gave me the colours for the image. These have been mounted onto Kraft card. I've used Copics and a few Prisma Pencils to add more definition/shading. Final Touches - Distress ink around the edge of the paper and scissors to roughen and a very small amount of brown polka dot ribbon. That's about it for now and hopefully you will get some time to join us over at Everybody Art Craft. Our challenge over at Papertake Weekly is "April Showers" which is fitting for the weather the UK is now suffering with. I've used another Saturated Canary image, this one is called rainy days. The backing paper has umbrellas on it but its difficult to see them with all the other layers and to soften the edges I've embossed with white powder. The other paper used is from a Jillibean Soup pad. Copics used - Dress - B000, B00,B02, B45, Apron & Umbrella - Y11, Y02, (I can't remember the darker colour), Wellies - Y11, Y03, G21, Skin - E000,E00, E21, E02, Hair - E53, E31 highlighted with Sepia Prisma Pencil. 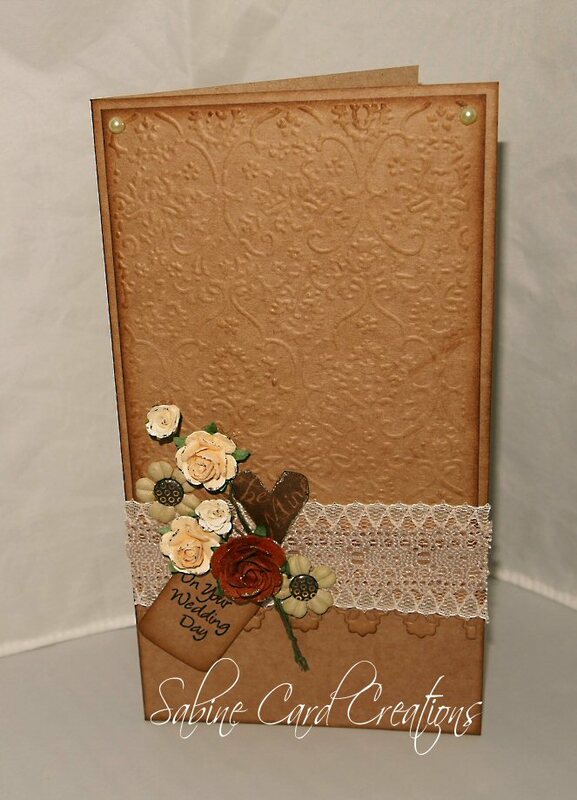 Other embellishments - ribbon, flowers, Memory Box fence die, Martha Stewart punch. I hope you have had an enjoyable Easter break. 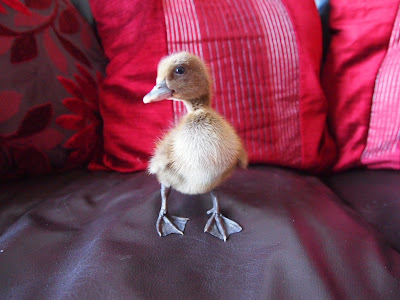 My weekend has been taken up with playing Mum to 5 baby Ducklings that hatched a week ago. They are a little camera shy but I managed to get a couple of photos. 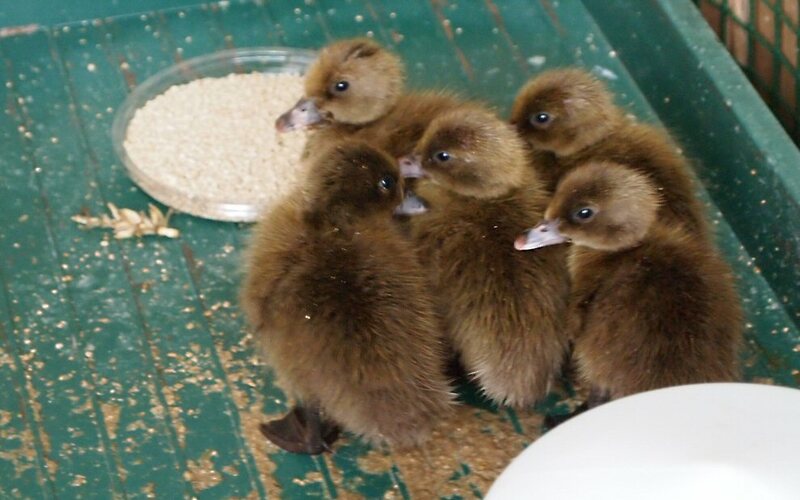 Unfortunately, they don't stay like this for long, in 6 weeks time they will be fully grown Khaki Campbells wreaking havoc in my garden. 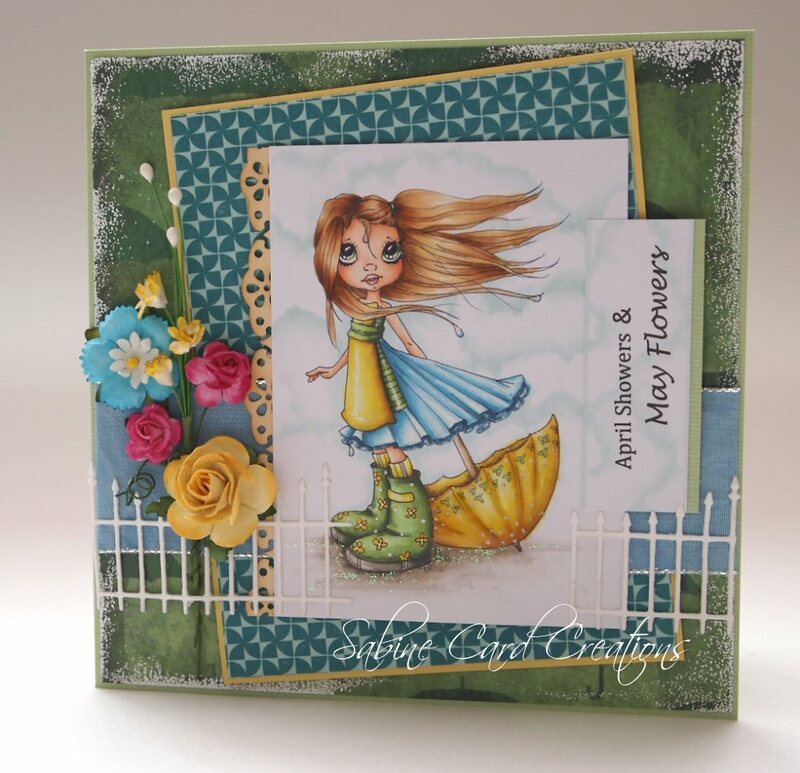 OK so back to this week's challenge over at Everybody Art Challenge, today we would like to see your "Spring" projects. Breast Cancer Awareness and as its Spring there are a number of up and coming events taking place around the country. I've made this card for a family member that has managed to beat the illness, luckily. Inspiration for the finished card came from the base card, it's ribbed texture is so tactile I wanted to show more than I usually do and it is about as clean and simple as I can do. Paper and layering - pink Bazzill card, Basic Grey paper, stitched around the edge. 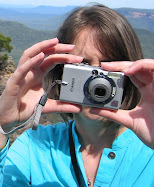 Image - Freebie from Saturated Canary (you need to become a follower). 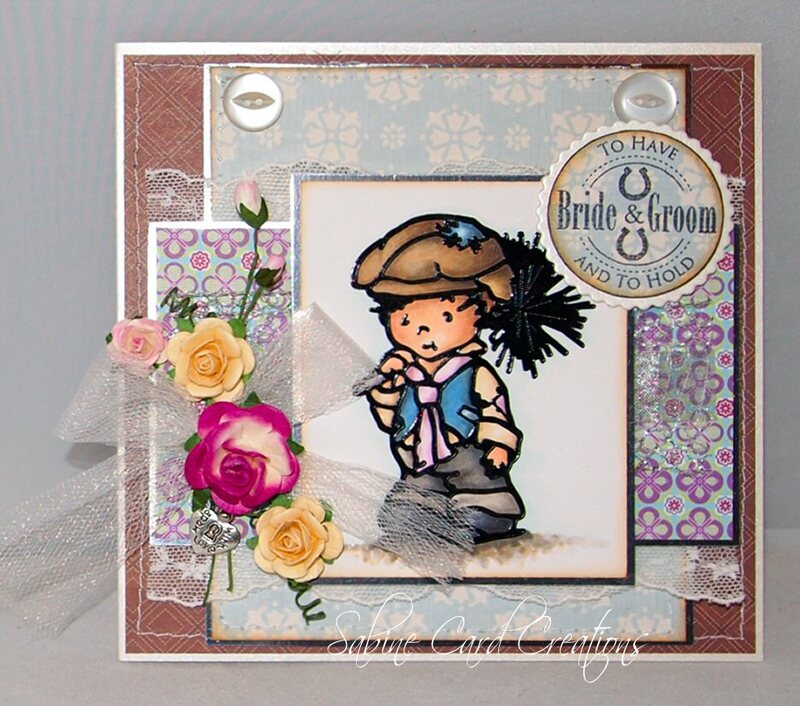 Embellishments - Pink satin ribbon, pearl brad, Letraset words and Happy Birthday stamped image on Kraft card. 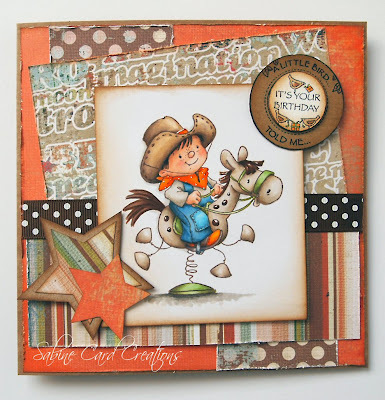 Afternoon crafters, I'm back again with this weeks challenge from Papertake Weekly. Our theme is "Anything Goes, with the option of monochromatic" and we are sponsored by Lili of the Valley. Not too much to say about this one except it was quite quick to make and colour and although I've created a birthday card, I think the image would also work for an Anniversary or Christmas card. 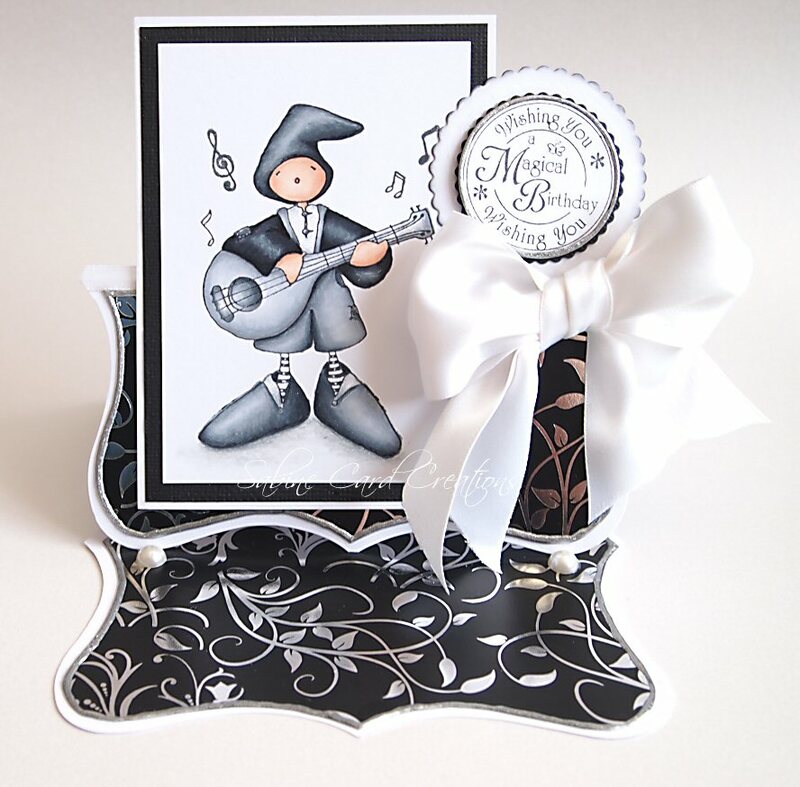 Base card - shaped white card, black bazzill. I've had the swirl paper for so long I can't remember where I got it from. Be sure to check out my fellow DT creations for lots more inspiration. It's our first craft challenge for April over at Everybody Art Challenge and what better way to celebrate the up and coming Easter weekend than with an Easter theme. I associate April with new beginnings and lots of baby animals, hence the rabbit theme on my card. Usually I stamp my images using black Memento ink but for a change I used rich coco and I really liked the effect as it muted the colours and gave a shabby chic feel. Paper - Pale blue taken from the Basic Grey Koshi pad and embossed with a daisy design by Crafts Too. Bunnies paper by Nancy Watt. I've had my paper for some time but you can still buy it from Making Cards Magazine April 2009. Medium - Copics,Prisma pencils (to add more definition) and Distress Ink - worn lipstick and brown corduroy. Embellishments - Lace, ribbon, paper flowers and others, metal button, LOTV sentiment.